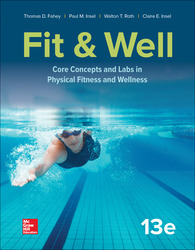 What's covered: Comprehensive coverage of all the topics common to fitness, wellness, and personal health courses. Teaching Approach: Hands-on, science-based approach weaves current data and statistics in accessible formats that speak to different learning styles. Digital Tools Available: Connect, LearnSmart Prep, LearnSmart Labs include unique assets such as documentary videos and Diversity Matters assessment activities.